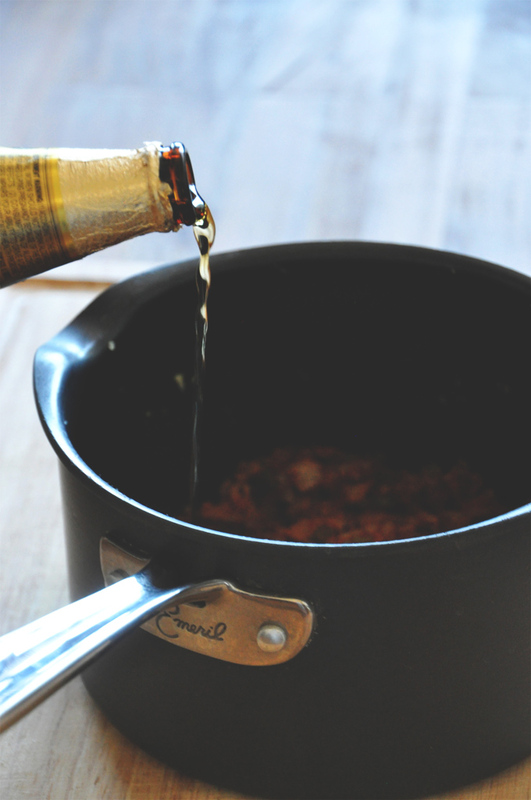 I don’t know if you’ve ever cooked with beer, but if you haven’t you probably should. I am not a beer drinker myself in the slightest – an occasional hard cider at best – but I love what beer does to dishes. Somehow, it brings a new depth of rustic flavor to recipes that I absolutely adore. Though it was the last thing I expected, I am very much in love with this chili. Of course, you can add meat to this dish if you’d like. I’ve tried it both ways and like them about the same. To do so, simply add a half pound of ground beef or turkey in place of the black (or kidney) beans for an equally delectable result. 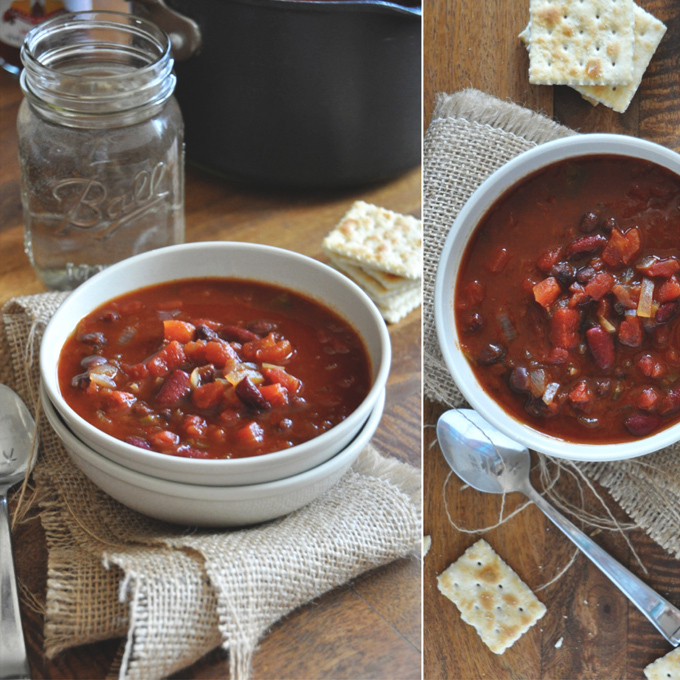 When I make this chili I love having it for two meals in one week for the sake of convenience and cost. One night, we’ll have it as is with a side of cornbread, and another we’ll have it atop baked sweet or regular potatoes. I can’t decide which way I like it better – I’ll have to get back to you on that. 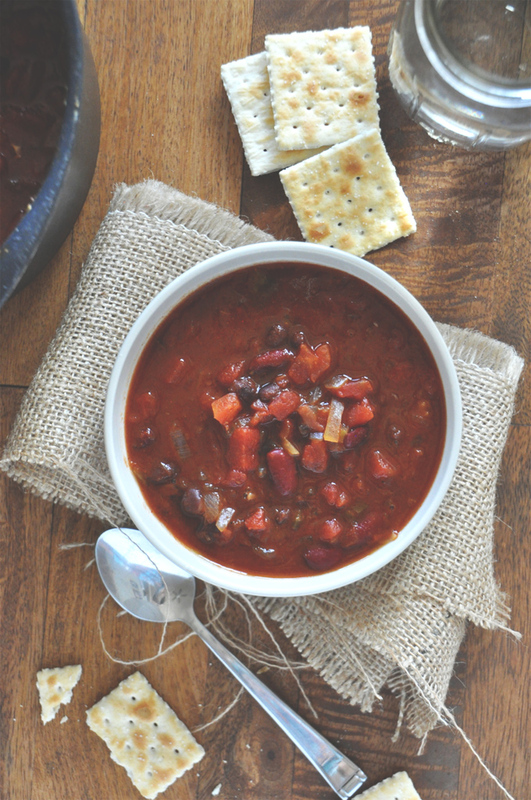 A satisfying vegan chili with hearty flavor from dark Mexican beer and both black and kidney beans. Heat the oil in a large saucepan or pot over medium-high heat. Add the onion, garlic, green pepper and 1/2 teaspoon each salt and pepper (amount as original recipe is written // adjust if altering batch size). Cook, stirring often, until softened - about 6 to 8 minutes. Add the chili powder and hot sauce, stir and cook for another minute. Add the beer and cook until reduced by half - about 6 to 8 minutes. Add the tomatoes (with their juices), beans (slightly drained), and 1/4 tsp each salt and pepper (amount as original recipe is written // adjust if altering batch size). Bring to a simmer while breaking up the tomatoes slightly with a spoon. Cook until thickened - about 25 to 30 minutes. Serve with hot sauce, crackers and cornbread, or whatever toppings you prefer. If you're not vegan, cheese is a nice addition. 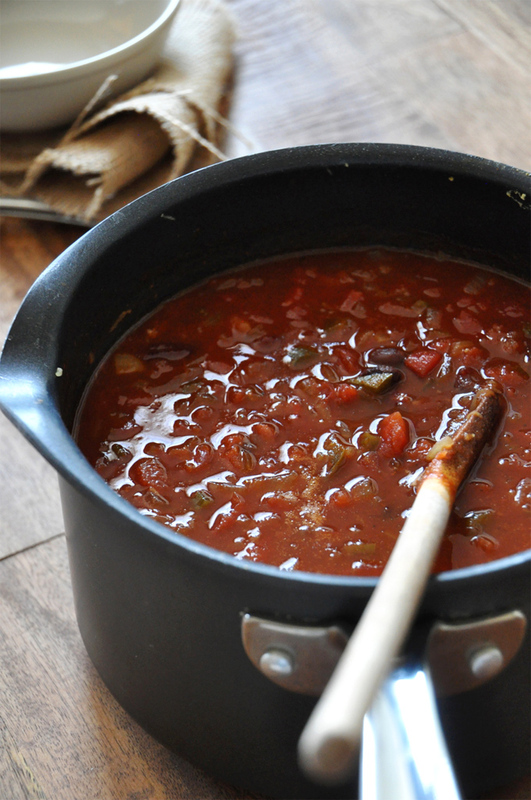 *This chili gets better with age like most soups, so if you can make it in advance, that would be preferable. This way the flavors grow more intense and the whole dish melds together a bit better. You could either get a gluten-free beer, or just omit! Love making this recipe but I’ve added chipotle peppers with about a tablespoon of adobo sauce to add more smokiness and kick. I also often opt for a stout and add some cocoa powder to make it slightly more mole-like. Thanks for sharing your additions, Sahra! Just made this chili today for the second time! This recipe is a winner – and I had all the ingredients already in my pantry. I used a Frank’s RedHot Sauce, New Belgium Black Lager and roasted red peppers instead of green peppers (put them in once the onions and garlic had already softened). 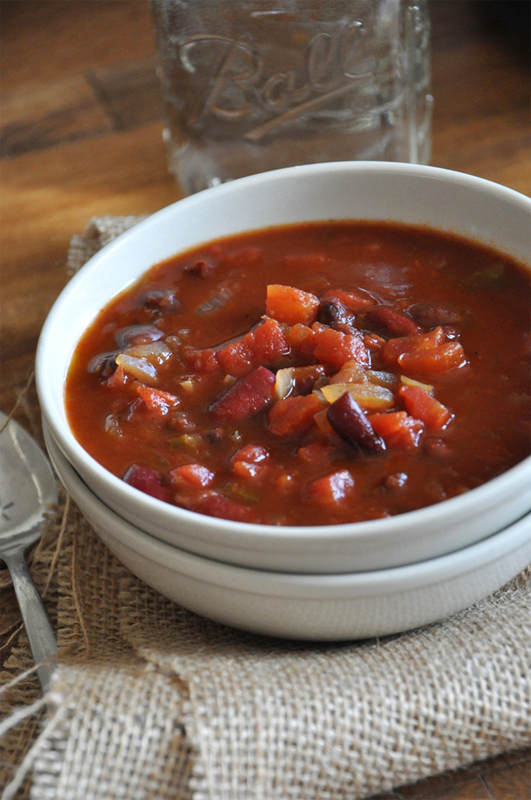 It turned out great – hearty and filling with a kick! I think it would be really yummy topped with some sliced avocado and cilantro. Just to clarify when you say this is best made in advance for the best flavor do you mean the morning of the day you’d eat it for dinner or would it work to make it the day before you’d have it for dinner? Store in the fridge and then heat up for dinner. It would be made about 24 hours in advance. Thanks! Hi Vivi! It would work to make it the day before and heat it up! Will this still taste good if I make it and leave it covered on the stove for a couple hours then reheat it when I get home? Thanks! This is tasty! I used Lagunitas Brown Shugga’ for the beer and it came out great! One question though: is it possible to freeze this for a later date? If so, any recommendations on the reheating process? Hi Pablo! It should last for about a month in the freezer, I would reheat it on the stove! Thanks for this excellent recipe! I’ve made it quite a few times, but today I used a stout beer and I put a chipotle in adobo sauce. Clearly the best chili I’ve tried yet. For beer lovers, Negra Modelo is a fairly light beer. I think this recipe would be fantastic with a chocolate stout, even better yet, a chocolate chili stout. As soon as I try it I’ll let you know. I made this for the family, they loved it. II made this with the vegan cornbread they were in love!! They want me to make moretonight lol. I added a few things like corn, salsa, some veggie broth, and green bell pepper. Came out beautifully ! Hi Schyler! Yes, I would say it’s about 1 cup! Looks delicious! Can I make this in a Crock-Pot? Hi! We haven’t tried it, but let us know if you do! Loved how easy this recipe was, just a few suggestions: if you like it thick, add a flour/cornstarch-slurry and don’t drain the beans. Add some (vegan) chicken or beef (or fish) stock for some extra oomph to wow your omni family, as they informed me it was missing that special ingredient. Make it xtra yummy w/ some sliced green onions and cheese as toppings. I’ve heard that some people add coffee and/or chocolate as a secret ingredient. Can someone tell me if they do this and how it tastes like as the final result? These additions + the negra modelo for depth made a phenomenal chili! If you were to add bulgur to it… would you let it cook in the beer, or separately in water or broth and combine later? Bulgur? Hmm, I’ve actually never cooked with that. It almost seems like it should be cooked separtely and added in with the tomatoes and beans? Just wanted to let you know that I made this recipe (accompanied by your cornbread) for 6 major meat-eating guys in France, and it was a huge hit. Cooking for French people always comes with high expectations, and this recipe was a complete win. Thanks for your creativity! Excellent chili!! Also worked nicely for our Super Bowl guests who were used to having chili con carne. I like how you left out cumin and vegetable stock; beer and soaked-bean liquid replaced those so nicely. 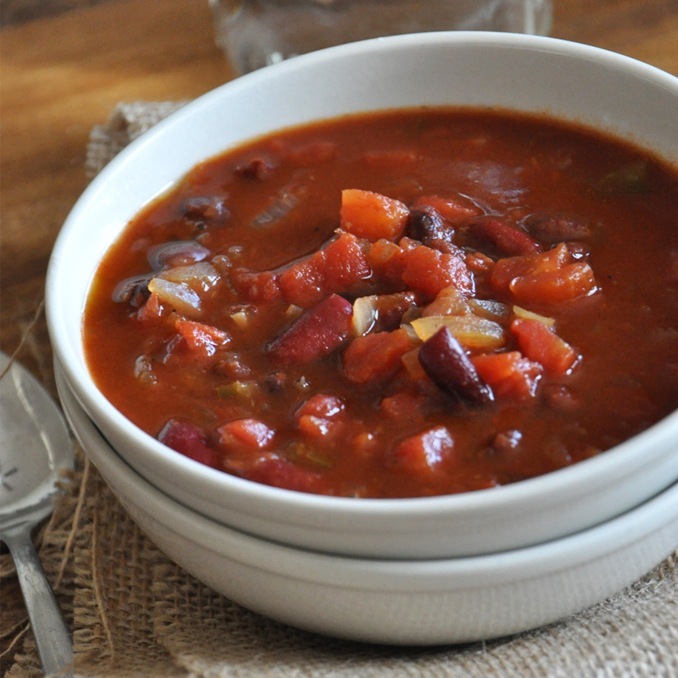 Instead of using chili powder, I used a blend of fresh ancho and chipotle chil powders. We served ours over jasmine rice with scallion, cilantro, and Daiya cheddar, and it rocked! Everyone was impressed with your “Vegan Cornbread” on the side. Hey! I am currently in the final stages of making both this and your almond blueberry lemon bars. Loving your site so far. Thanks for the amazing recipes, ! We just finished wolfing this down :) yum! What a great recipe! My family had made something similar for years but this was way better! The dark beer adds a great flavor! We added diced turkey breast at step 4 so that it soaked up the beer flavor. If you have leftover turkey, you could do the same but add it after the tomatoes. We topped it with cheese and avocado – yum!! I’m sure a dollop of sour cream would’ve been great too. I think I did something wrong. For starters not sure I got the right smoked peppers. Too much something. Cinnamon? Also, bought the wrong king of diced tomatoes (italian) and so had to make do with 1 can. Chili cook-off tomorrow: My ruination. Woah! Where in the recipe does it say to use smoked peppers? It calls for regular bell peppers, whatever color you want. No cinammon either. You can add spicy peppers if you like, just remember that it already calls for 1 tbsp cayenne and an optional 2 tsp of hot sauce. As for the tomatoes, if you can’t use canned, go with fresh tomatoes and just measure it out. I made this tonight. We don’t drink beer either so I used a Corona someone left after a dinner party, which seemed to work just as well as a dark beer. My husband is newly vegan and told me he’s happy to eat vegan so long as the meals taste good, and we’ve both loved this and the growing list of dishes I’ve made from your blog. I’m a vegan, no one else in my family is, so it hard for us to find a meal I can eat that the whole family likes too. Someone always complains that he is eating rabbit food! But I did try this Chili tonight! And this has to be one of the best chilis I’ve ever had! My whole family ate it too, and we had no leftovers! I will make this again and very soon, along with making a second batch so I can have leftovers. This repice also seems to be very forgiving, I used what beer I had on hand since I didn’t want to go out and buy new beer. I added extra hot sauce too, since we like spicy food. So great! Thanks for sharing, Amber! I prepared this dish today, so that it could develope over night, but it is already so good! I have never cooked with beer before, but omg. I didn’t use a Mexican Dark Beer since I am in Germany and can’t find that here. I used a German Dark Beer called Köstritzer that my dad recommended and it just gave so much amazing flavor, totally was not expecting that. I added some more spices to it, from a different chili recipe that has been in my family for years (just some paprika, cayenne pepper and bay leaves). Thank you for this recipe! For instance, even a simple SMS “Hi, I’ve joined XYZ Automobiles as a sales manager. You can travel all over the world in high end luxury resorts. The building has been constructed on a discarded power station so has a unique shape. lacked a little for me, will make it again, but with a few changes. good start though! -add chopped celery and carrot when adding onions. brown really well then add garlic for 1-2 minutes. -spices, instead of 1 Tbsp chilli powder, I use 1 Tbsp smoked paprika, 1 tsp chilli powder, 1 tsp cayenne, 1 Tbsp brown sugar, a tsp or 2 of liquid smoke – it’s milder for my gf’s tastes, and smokier for mine. also add a little thyme. also make sure you pick a really good, strong dark beer. makes a lot of difference. Made this for an improv super bowl party couple weeks back, and everybody loved it! I’m studying abroad with some of my fellow homesick students, and the taste of home (and beer) made us all feel a little better. :) I did add some extra ancho chili pepper and a strange spicy banana sauce (my host mother made it), and the chili came out with an awesome spicy kick to it. 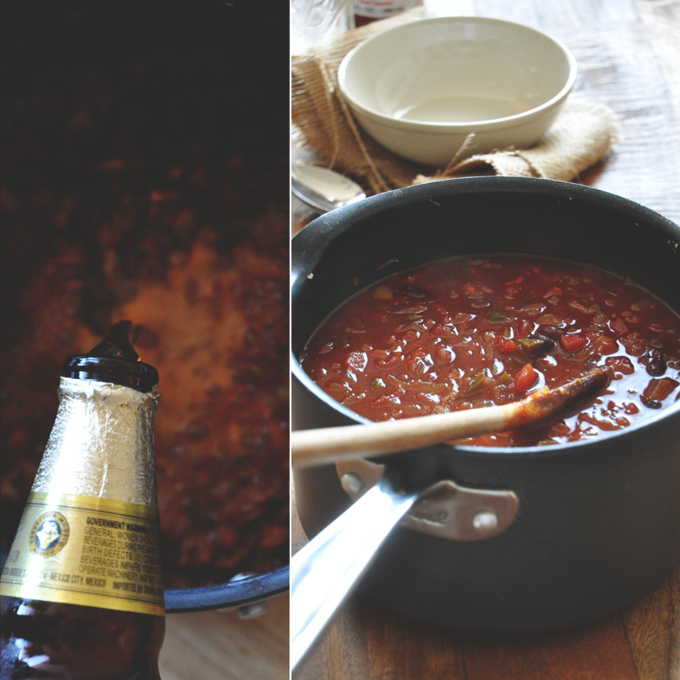 I have a hard time finding chili recipes my main squeeze will like, but this has beer, so it will fit the bill! It is really a nice and useful piece of information. I’m happy that you shared this helpful information with us. I’m at work daydreaming about this dreamy chili. I just love that there’s beer in it too! Looks really ridiculously good. Made this for friends over the weekend. Ended up doubling the recipe. So delicious! Added chopped jalepeño and cayenne pepper for an added kick. The beer adds a wonderful robust taste. Great leftovers too! Lovely to hear! Thanks for sharing, Kelly. Does doubling the recipe call for doubling the cooking time on the stove as well? Maybe not double, but perhaps a bit more – maybe 15 to 25 at most.